Bakery wastes are products obtained from the recycling of bakery and viennoiserie industry (croissants, sweet breads, cakes, dough, tarts or pies), raw or baked (Simpson, 2012). Bakery wastes are a combination of different wastes, and their composition is thus highly variable (McGregor, 2000). Bakery wastes are mostly breads removed from the food market as they become unsellable after only 24 hours, but they can consist in any other ingredient like dough, flour, sugar and other edible ingredients, such as icing, burnt or broken product (Crawshaw, 2004; McGregor, 2000). Bakery wastes may contain ground plastic bags as the bakery wastes are unwrapped mechanically (McGregor, 2000). Bakery wastes are extensively used as feed for farm animals which reduces their disposal and alleviates environmental issues (Westendorf et al., 1996). Any bakery waste can be used on farm provided it does not contain meat, fish or shellfish. Bakery wastes may also provide valuable and readily hydrolisable feedstock for industrial fermentation (Magbunua, 2000). 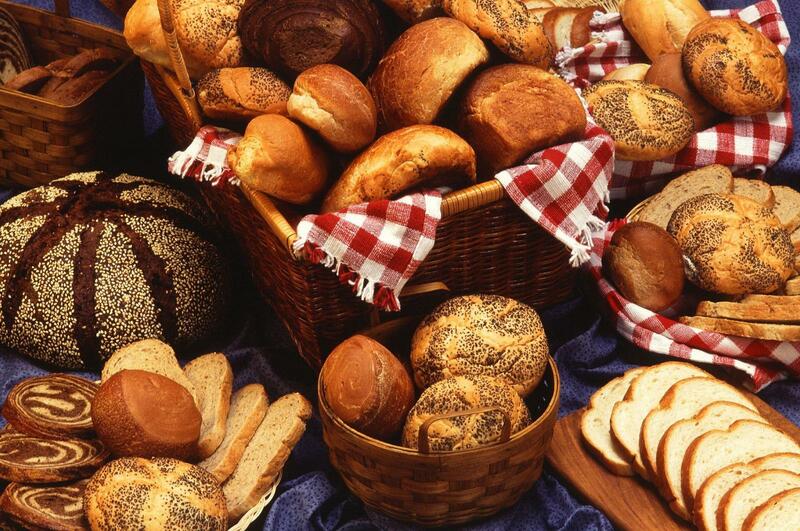 Stale bakery products can be used in the biopolymer industry to produce poly-lactic acid biopolymer (Plascarb, 2013). Baking bread is done since the beginning of the Roman Empire. Bakery is now a major food industry in the world and varies widely in terms of production scale and process (GIA, 2017; Chandrasekaran, 2013). The global bakery market is expected to exceed 570 billion US$ by 2024 (GIA, 2017). In 2015, in the USA, bakery sales represented 36 billion US$, and in the EU, it was as high as 119 billion US$ (Statista, 2017). Europe is the largest market expected to slightly decrease. The European volume of bread was 11.7 million tonnes in 2010 and would be about 10.64 by 2021. Asia is the fastest growing market, with its population shifting from rice based diet to wheat food based products. It would become greater than the European market by 2021 (12.09 million tonnes) (Statista, 2017; GIA, 2017). Bakery wastes are produced at every stages of production. It is estimated that 10-25% of discarded products and wastes go to animal feeding and are thus not considered to be waste (Chandrasekaran, 2013). In 1996, in the USA, the amount of bakery wastes was reported to represent 5.5% of total waste (Westendorf et al., 1996). In Norway in 2013, approximately 14% of total fresh bakery goods produced were reported to be wasted during the production stage (Plascarb, 2013). Bakery wastes have a long history as feeds. In 1892, bread and dough residues were already recommended for livestock feeding as they were a source of more digestible energy than raw flour (Cornevin, 1892). They can consist of unsold breads and bakery products that have reached the end of their shelf-life and are then discarded as waste. They can result from inappropriate lot sizes/minimum order quantities. Big pack sizes of pre-mixed ingredients may yield surplus that need to be stored or discarded. In a similar way, bakery waste can result from inappropriate size of production batch and result in wasted dough. They can be low quality products: default size or texture, burnt products, etc. (Tesco et al., 2014; Chandrasekaran, 2013). When bakery wastes are intended for animal feeding, the problems relate primarily to animal health concerns, moisture content, and nutrient variability. It is important to properly process bakery waste for feed safety. A broad range of processes such as extrusion, dehydration, pelletisation or silage of bakery wastes have been assessed in order to have good preservation and storage of the resulting feedstuffs. Waste processing depends on the nature of the waste. 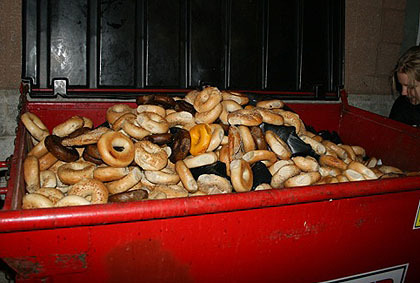 Bakery wastes are considered to be safer than other food wastes. In the USA, they are subsequently not submitted to the obligation of boiling during 30 minutes as are the other food wastes (Westendorf, 2000). In the UK and in the USA, where breads are mainly in the form of sliced loaves and packed in plastic bags, discarded breads are collected, unpacked and ground so that less than 1% plastic or aluminium residues are still present in the feed (McGregor, 2000). The process is shown in the video below. For better storage, it is useful to dry bread from its usual 63-65% DM to 90%. Another way to preserve bakery waste is to ensile it. Ensiling of bakery waste could be done in association with acid whey: it resulted in effective fermentation process and provided could quality silage (Rezende et al., 2016). Bakery waste could also be ensiled in mixture with other grocery waste (Froetschel et al., 2014). Bakery waste is a highly variable product. It is typically poor in fibre, but protein and fat can range from less than 4% to more than 25% and 15% respectively. Sugar and starch contents are also highly variable, as are mineral (particularly sodium) and energy contents (Arosemena et al., 1995; Waldroup et al., 1982,). Therefore, it is recommended to analyze bakery waste before inclusion in diets, at least when using a new source or when the source is known to be inconsistent (Mahmoud, 2017; Guiroy et al., 2000; Arosemena et al., 1995). 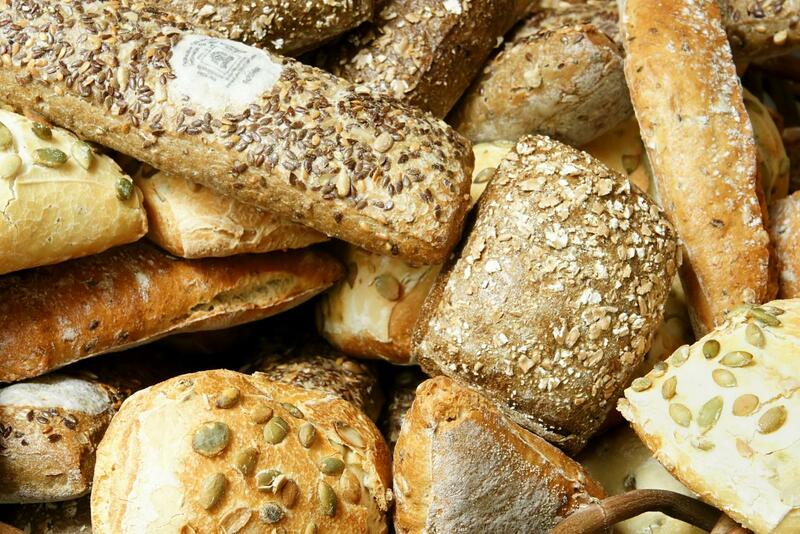 Bakery waste, such as stale bread and crumbs, can be dried and mixed for animal feeding. It is rich in fat and carbohydrates, but the protein quality and the vitamin content are low. It has been used as a substitute for grain in rations for all classes of livestock. When bakery waste is fed in large amounts, it must be supplemented with vitamin A, minerals and good-quality protein. Bakery waste may have a high salt content (McGregor, 2000). Bakery wastes are prone to molds. Feeding rotten bakery wastes to livestock is detrimental. In 1892, it was reported to cause nervous disorders, anormal salivation, increased heart beat frequency, blindness and even death in growing pigs and horses (Cornevin, 1892). The EFSA reported that cereal products, among which bread and fine bakery wares, made the largest contribution to the estimated zearalenone exposures. Zearalenone is a mycotoxin produced by a cereal fungus of the Fusarium genus. Pigs are particularly sensitive to zearalenone that has several oestrogenic effects (EFSA, 2011). In 2001 in Canada, an outbreak of botulism occurred in a herd of feedlot cattle that had been fed on different carbohydrate wastes, i.e. potato waste and bakery waste. Clinical signs of botulism were lower feed intake, malodorous faeces, progressive weakness, ataxia, recumbency, and death. Out of 795 animals, 52 were ill and 14 died. The bakery waste was considered the likely source of the toxin and was found positive for the presence of Clostridium botulinum type D. Two days after the removal of bakery waste from the diet, there were no new reported cases of botulism in the feedlot (Heider et al., 2001). This was the unique case of Clostridium botulinum contamination of bakery waste. Toxin discharge probably occurred since heavy rains provided suitable anaerobic conditions for Clostridium previously present in bakery waste (Heider et al., 2001). During the late 1990s several incidents of dioxin contamination in bakery waste used for feed were reported in Germany and the Netherlands. The amount of dioxin in bakery waste was 15 times over the current limit (12 ng TEQ/kg vs. 0.75 ng TEQ/kg). Contamination was reported to be due to the waste firewood used to dry bakery waste (Hoogenboom et al., 2004). Bakery waste can be used to feed ruminants. It has been included at up to 30% in cattle rations without affecting palatability. Due to its high concentration of non-fibrous carbohydrates and its relatively low crude protein content, it can be used as an energy concentrate that has to be supplemented with a source of protein (Waldroup et al., 1982; Arosemena et al., 1995; DePeters et al., 1997). Bakery waste is also characterized by a high OM digestibility (96% in sheep) and a high ruminal degradability, with a measured rate of rumen degradability twice as high as that of barley (Afzalzadeh et al., 2007; Champe et al., 1980; DePeters et al., 1997). Although dried bakery waste are reported to be included in feeds intended for dairy cows, feeding value of bakery waste has been mainly evaluated in growing lambs and steers (Arosemena et al., 1995; Champe et al., 1980). Inclusion of this by-product in the diet of these animals could be an interesting way to reduce feed costs (Hindiyeh et al., 2011; Obeidat et al., 2012). In most cases, bakery waste could be included at up to 30% in ruminant diets without affecting performance but this level depended on the amount of fibre included in the basal diet and on the specific composition of the source of bakery waste. In fattening lambs, bakery wastes have been used in substitution of maize (Oliveira et al., 2011; França et al., 2012; Santos et al., 2014; Mahmoud, 2017) or barley (Champe et al., 1980; Afzalzadeh et al., 2007; Hindiyeh et al., 2011). In the experiments where bakery wastes were used to replace maize, the maximal proportion of bakery waste in the diet was 35% DM and the proportion of hay in the diet was generally high, between 40 and 60% DM. In those conditions, inclusion of bakery wastes in substitution of maize grain had no effects on nutrients intake, digestibility, and body weight or meat composition of fattening lambs (Mahmoud, 2017; Santos et al., 2014; Oliveira et al., 2011). When bakery wastes were used to replace barley, results were more contrasted, most probably due to the variability of bakery waste and experimental conditions (Hindiyeh et al., 2011; Afzalzadeh et al., 2007; Champe et al., 1980). The replacement of barley by bakery waste (25% dietary DM) in a sheep diet based on 40% alfalfa had no impact on DM intake, final live weight, average daily gain and carcass weight of lambs (Afzalzadeh et al., 2007). Linolenic fatty acid content of meat was increased with increasing inclusion of bakery waste likely because of the high soluble sugar content of this feed (Afzalzadeh et al., 2007). On the contrary, the inclusion of only 10% of bakery waste in the diet of lambs resulted in a slight decrease of intake, a much higher daily intake fluctuation and finally a slightly lower final body weight and growth rate. These results could be explained by the fact that the bakery waste used in this study was 80% highly fermentable wheat flour and that the forage included in the diet was only wheat straw, included at 20% DM, a possible cause of subacute acidosis (Hindiyeh et al., 2011). A diet containing 40% dried bakery waste was not well accepted by sheep even in the context of a digestibility trial with limited amount of feed (Champe et al., 1980). It was reported that bakery waste could be included at up to 20% in suckler ewes diets containing 30% wheat hay, in substitution of barley, without affecting either performance of ewes (nutrient intake and digestibility, body weight changes, milk production and composition) or performance of lambs (initial and weaning body weight and average daily gain) (Obeidat et al., 2012). In fattening kids, bakery waste could be included up to 20% to replace barley in a low forage (20% alfalfa) based diet without affecting dry matter intake. DM intake, average daily gain, final weight and total weight gain decreased when bakery waste increased to 30% DM (Haddad et al., 2004). The inclusion of a relatively high percentage (55%) of bakery waste (DM basis) in fattening Angus crossbred steers diet containing less than 30% forage (maize silage and hay) had no effect on the average daily gain and on carcass and meat organoleptic characteristics, even though the DM intake decreased with bakery waste (Guiroy et al., 2000). In this experiment, the inclusion of bakery waste was high (more than 55% DM), with an amount of forage (maize silage and hay) below than 30% DM. Inclusion of bakery waste at up to 30% DM dietary level to replace maize and barley had a slight positive effect on weight gain of Sarabi crossbred steers (Seyedi et al., 2012). Bakery waste was also successfully used in mixture with broiler litter (36% bakery waste, 64% broiler litter), in substitution to a concentrate feed and rice straw, to feed Korean Hanwoo Steers (Kwak et al., 2003). In the USA, weaned piglets (17 kg BW) were fed on 50% bread waste. They had lower growth rate, lower slaughter weight and longer time to slaughter. It was thus recommended to use bread waste in association with supplementary protein (Hawkins et al., 2006). In India, growing crossbred pigs could be fed on bread waste during 3 months, in order to replace maize in their diet. It was reported that animal growth slightly increased while feed conversion ratio remained unchanged up to 50% maize replacement. The authors confirmed that including bread waste was economically effective (Kumar et al., 2014). These results were in accordance with higher average daily gain, higher backfat thickness and higher inner fat observed in Italia, in Cinta Senese local breed of fattening pigs fed on 50% bread waste (Sirtori et al., 2007). Bread waste also decreased cooking losses by 3.7% (21.0 vs. 17.3%). In Japan, fattening pigs fed on 50% bread waste required more time to reach slaughter weight (110 kg BW) since they had lower ADG. Among meat quality characteristics, it was reported that their marbling score was higher, as was the inner fat of their longissimus thoracis (+2%). Saturated fatty acids increased while unsaturated fatty acids were reduced and examined for meat quality (Iwamoto et al., 2005). Above 50% inclusion, bread waste was reported to cause constipation due to a global loss of fibre in the diet. Feed intake was also reduced due to a decrease in feed choice (Kumar et al., 2014). In India, a diet consisting of 50% rice bran and 50% bread waste that was commonly prepared by farmers was not recommended for pigs as it could not meet animal protein requirements (Kumar Ajay et al., 2014). Similarly it was shown that a traditional pig diet based on bread waste was less effective than other traditional feeds based on kitchen waste or cooked poultry offal (Chakurkar et al., 2014). Supplementing the diet of lactating sows with 15% bakery waste decreased their voluntary feed intake by 10% in comparison to the control. However, their productive performances were unchanged (Superchi et al., 2008). Bakery waste is well adapted to poultry nutrition. Due to its variable composition, feed formulation should be adapted to the real composition of the product used, in particular protein and fat content. Economic gain associated to the use of bakery waste in poultry was underlined by several authors (Al-Ruqaie et al., 2011; Olafadehan et al., 2010). Bakery waste can be used in broiler diets without affecting growth, feed intake and feed efficiency (Damron et al., 1965; Catalá-Gregori et al., 2009; Saleh et al., 1996). Dried bakery waste replaced maize without adverse effects, up to inclusion levels higher than 25% (Al-Tulaihan et al., 2004; Saleh et al., 1996). Total replacement of maize was even possible with the use of extruded bakery waste, used at levels above 50% in young animals and 60% in older broilers (Al-Ruqaie et al., 2011). No effect of enzyme supplementation was recorded, neither on performance nor on nutritional or energy value (Boros et al., 2004). Bakery waste is suitable for layers. Laying performance and feed efficiency were not affected by levels higher than 30% in replacement of maize (Olafadehan et al., 2010). Total replacement of maize was even possible without adverse effects on production (Torki et al., 2011). Enzyme supplementation had no effect on production (Torki et al., 2011). Stale bread or bakery wastes are traditionally used to feed rabbits in small familial units and backyard systems around the world, together with other kitchen, garden or market wastes (Rastogi, 1983; Degen et al., 2009; Christodoulopoulos et al., 2001; Garcia-Lopez et al., 2006). In balanced diets, bread wastes may completely replace cereals with interesting economical results (Al-Shami et al., 2009) and were included in growing rabbit rations without problems, up to 40% of the diet (Ayandiran et al., 2016). This type of feed is an interesting source of energy (mainly starch) for rabbits but with a low protein content (8-12%) and a quasi absence of fibre (~1% crude fibre). The digestible energy content was estimated between 14.9 and 17.9 MJ/kg DM (Ramchurn et al., 2001; Voris et al., 1940). Whatever the nutritive value, as for many by-products or waste products in general, a special attention must be given the fungal status of the product (absence of mould) and to the absence of mycotoxins (Mézes et al., 2009). Bakery waste could be included at up to 40% dietary level in carp fingerlings (1.65 g) in a diet containing 26% CP. The diet had no deleterious effect on fish growth (Carratore et al., 1995). This was in accordance with former experiments where bakery waste was suggested for dietary supplementation of carp (Jaffa et al., 1983, Shaperclaus, 1933 cited by Matty, 1986). In Nigeria, bread waste totally replaced maize in African giant catfish fingerlings (5.2 g) diet. Fish growth was enhanced by increasing level of inclusion of bread waste though feed conversion ratio was poorer. Another positive aspect of using bread waste was the removal of bread waste from landfill (Fakunmoju, 2014). Chen, P.; Yang, L.; Bai, R.; Hung, Y.-T., 2006. Bakery Waste Treatment. In: Wang, L. K.; Hung, Y.-T.; Lo, H. H.; Yapijakis, C., Handbook of industrial and hazardous wastes treatment, Second edition, Marcel Dekker, Inc.
Kosseva, M. R.; Webb, C., 2013. Food Industry Wastes: Assessment and Recuperation of Commodities. Elsevier Inc.